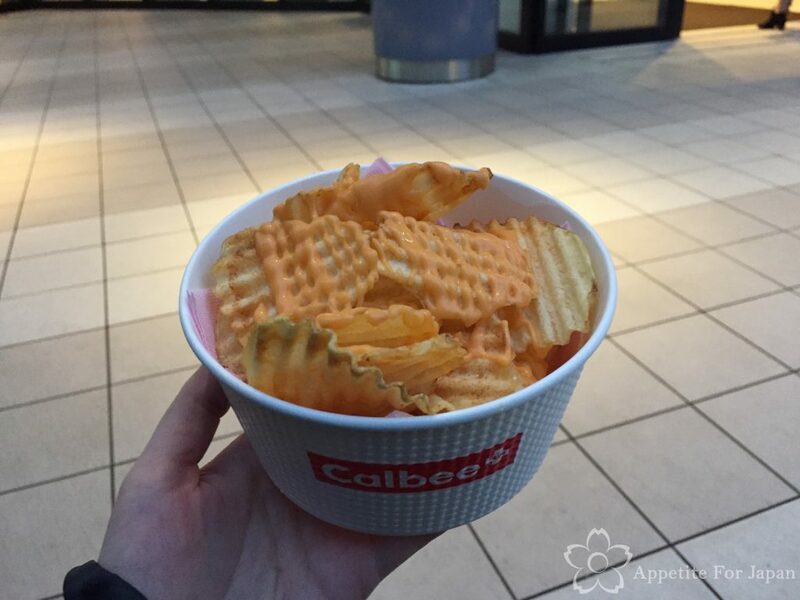 Calbee is one of Japan’s major snack companies, and there are Calbee Plus (カルビープラス – sometimes written Calbee+) stores around Japan. We were originally planning to visit the Harajuku store, but we knew we’d end up eating Japanese crepes, Zaku Zaku’s crouqant chou and Totti Candy Factory’s giant cotton candy, so we decided to be sensible and hold off until getting to Odaiba so that we could visit the Calbee Plus at the Diver City shopping centre. 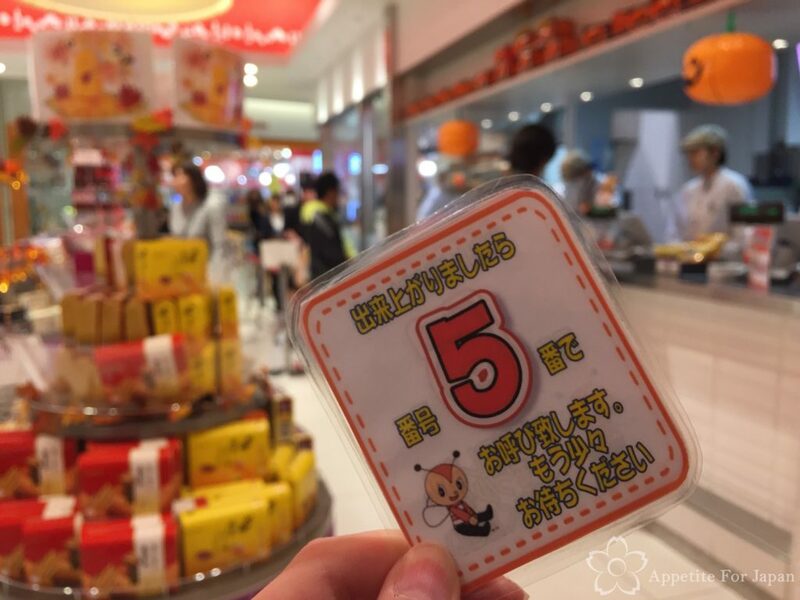 Note that the Odaiba store has now closed, but there are still three Calbee Plus stores in Tokyo including Harajuku and Tokyo Station. 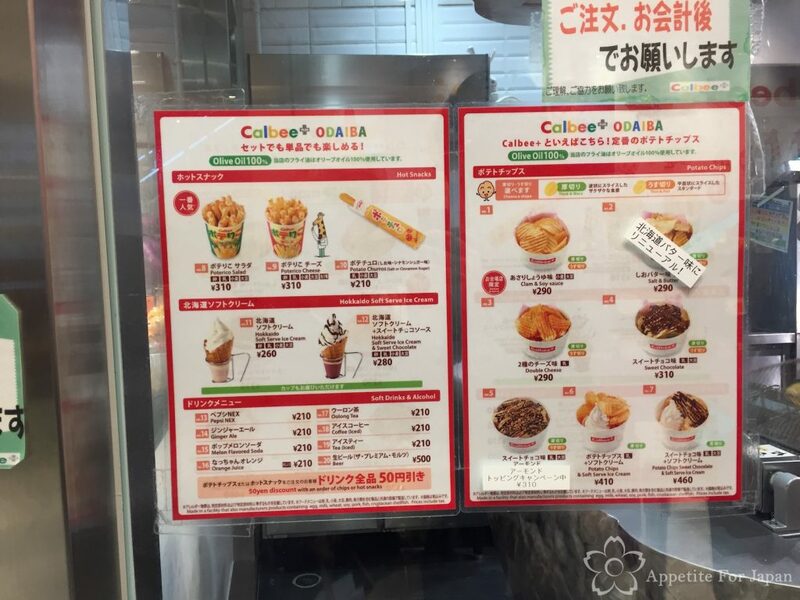 Above: The Calbee Plus menu includes fresh Poterico (based on Calbee’s popular Jagarico crisps – which are themselves based on actual hot chips, or fries, for my American readers), soft-serve ice-creams, drinks, and of course the most popular item, freshly fried potato crisps! The most popular combination is the potato chips drizzled in chocolate, with optional soft-serve ice-cream. 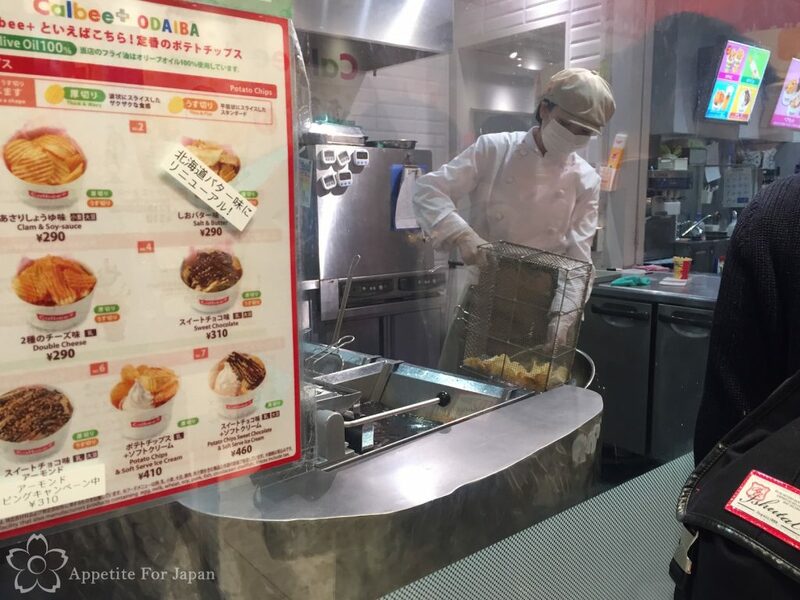 Freshly fried chips with chocolate cost 310 Yen, or 460 Yen with the soft-serve ice-cream. 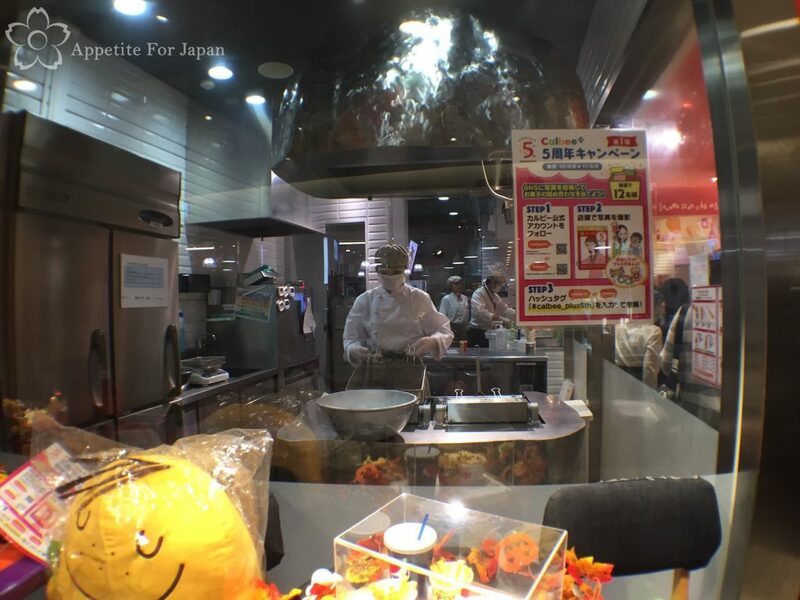 While you wait in the queue (because there will almost always be a queue), you can watch as they fry the potato chips. They are served so fresh that they’re still hot! 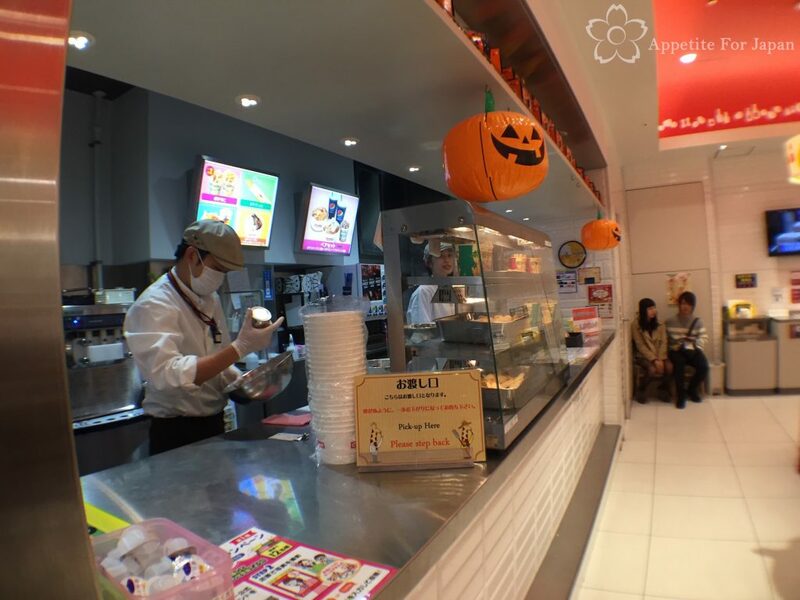 The first counter is actually where you collect your food. The second spot is where you place your order. There are a couple of seats, as well as a few tables, but there’s never enough room for everyone! 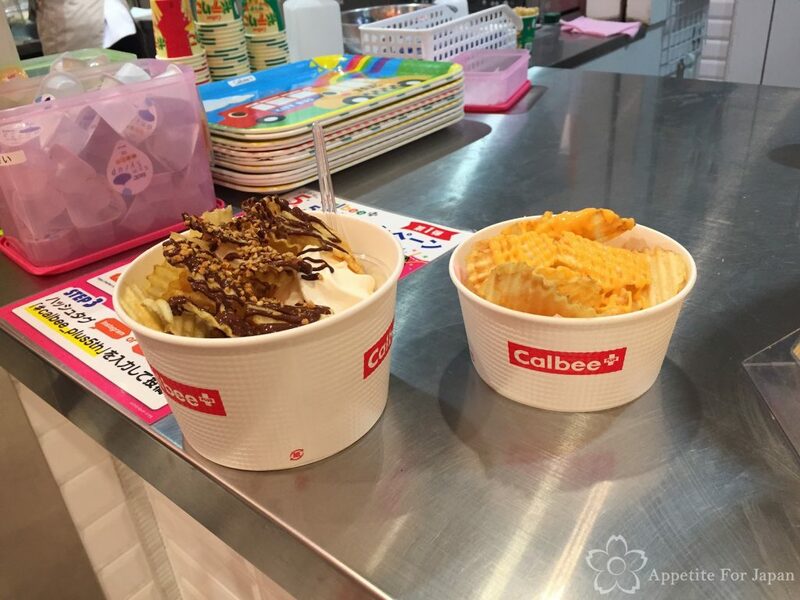 We went during the evening and ended up taking our food outside rather than trying to get a table in the Calbee Plus cafe. Once you place your order and pay, you’ll be given a laminated token with your number. Make sure you know how to count in Japanese so that you recognise your number. We ordered the chips with chocolate, nuts and soft-serve ice-cream (460 Yen), and double cheese (290 Yen). I was really disappointed with both. Neither of them had nearly enough topping. Both the chocolate and cheese were just drizzled on the very top of the chips; these were not generous servings of cheese or chocolate at all. 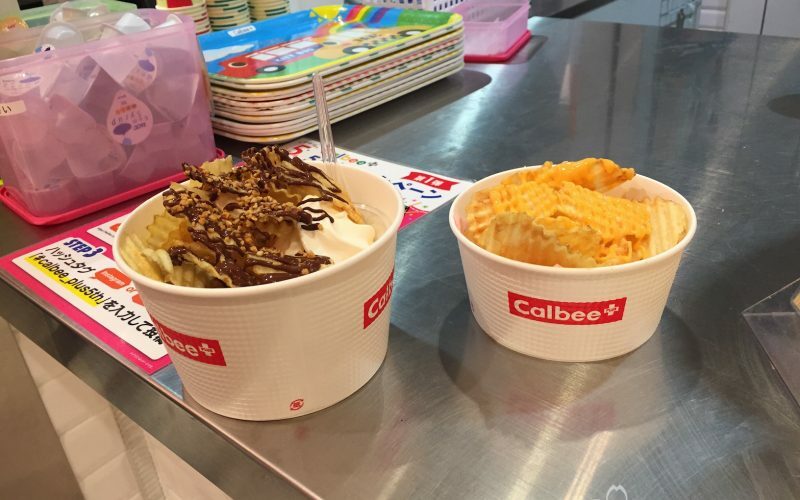 If we had ‘double cheese’, I think I really needed at least quadruple cheese… Had these been absolutely covered in chocolate (or cheese), I think Calbee Plus would have been great, but instead it was just a real let-down. Would I recommend Calbee Plus? I wish I could say that I would, but the lack of topping was so disappointing. I’m a big fan of Royce chocolate coated chips, which you can purchase at Japan’s international airports such as Narita and Haneda. 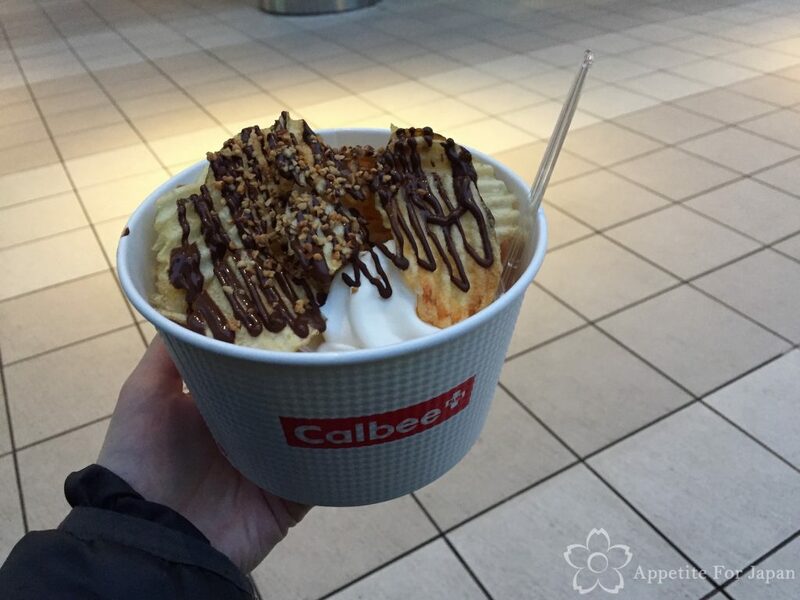 Calbee Plus doesn’t even come close.